January 8, 2018 – Silver Dollar City has removed the Lost River of the Ozarks rapids ride to make room for a huge new 2020 project. 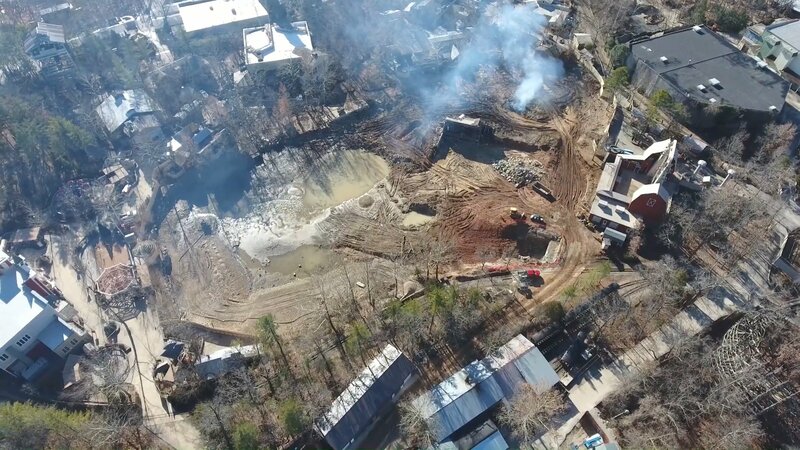 No announcement has been made by the park, but in addition to the ride removal and draining the lake, a very large area surrounding the attraction has been cleared. At a cost $2 million to build, Lost River of the Ozarks opened in 1985. 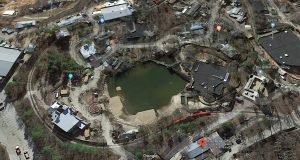 According to Silver Dollar City spokesperson Lisa Rau, deconstruction of the ride began about a month ago but she gave no hint as to why the ride is being torn down and what will replace it. Here is an aerial view from Google Maps showing what the area looked like before the ride’s removal compared with the image above. See what our members are saying about the ride’s removal and the 2020 project in our Forum discussion. This entry was posted in News and tagged Lost River of the Ozarks, New for 2020, removal, River Rapids, silver dollar city. Bookmark the permalink.